"Vice President of India, M Venkaiah Naidu, will lay the foundation stone for the construction of Dera Baba Nanak-Kartarpur Sahib road corridor (up to international border) at a function in village Mann in Gurdaspur district of Punjab on Monday, the 26th of November, 2018," a Road Transport Ministry statement said. 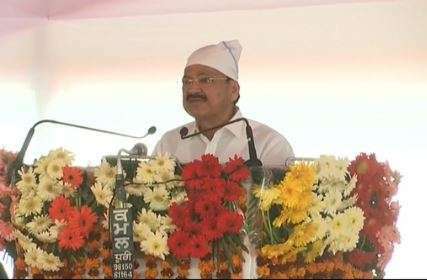 Vice President M Venkaiah Naidu on Monday laid the foundation stone for the construction of Dera Baba Nanak-Kartarpur Sahib road corridor in Mann village in Gurdaspur on Monday. The corridor will touch the international border with Pakistan. On the occasion, Union Transport Minister Nitin Gadkari, Union Minister of Food Processing Harsimrat Kaur Badal and Punjab Chief Minister Amrinder Singh will also be present. 9:35 am: Punjab Minister SS Randhawa puts black tape on his, CM and other Punjab ministers' names on foundation stone.Says, "I did this in protest against Parkash and Sukhbir Badal's names on stone. Why is their name here? They are not part of executive, its not BJP-Akali event"
As an integrated development project, the Indian government decided on November 22, 2018 to build the Kartarpur road corridor up to international border between India and Pakistan. It will let Sikh pilgrims visit the iconic Gurudwara Darbar Sahib at Kartarpur. On November 15, 2018, India and Pakistan had announced that they will build corridors on their respective sides to let Sikh pilgrims visit the holy shrine without visa. Corridor will also help them walk across and come back without having to secure a visa. At Kartarpur, Guru Nanak had assembled the Sikh community. He lived there for 18 years till 1539. The Gurudwara Darbar Sahib is built where he took his last breath. From Dera Baba Nanak in Gurdaspur district, the Indian side of corridor starts. It extends up to international border between India and Pakistan. The project corridor is to be developed by National Highways Authority of India and will be funded by the Government of India. The project corridor is four-lane with service road and all other appropriate amenities for pilgrims intending to visit Gurudwara Darbar Sahib, Kartarpur in Pakistan. Between India and Pakistan, this corridor will be a historical landmark. It will also boost tourism as more pilgrims would visit the holy shrine throughout the year between two countries, the statement said.